Some people buy Christmas gifts before Thanksgiving and some people wait till December 23rd. It’s just a thing. For those of you still on the hunt for perfect gifts you have 7 more days, so don’t worry! Everything listed here are great gifts you can absolutely grab in the next few days and would make so many people happy! So here are your last minute gifts! A Keurig is a GREAT gift! Any coffee lover, college student, new mom would love this! They come in a ton of colors and are reasonably priced! I am fairly certain ANYONE would love a one year membership to Amazon Prime! I have had it for about 8 years and I honestly don’t know what we would do without it. Another super cute phone case alert! This one is on Amazon Prime so you can for sure get it by Christmas. Any beauty lover would appreciate a gift card to Sephora! I have these slippers in plaid from last year and I wear them all the time! They are beyond comfy and seasonally appropriate! These might just be the best Christmas PJ pants I’ve seen all year! Give them to someone to wear on Christmas Day! We LOOOOOVE our Amazon Echo Dots, and my dad really wants one too! Maybe Santa will bring him one! This is great for anyone. We use it to add things to our grocery list, order things from Amazon, play music, tell us the weather, and so much more! Andrew and I both have Fitbit Blazes and we love them! This is a great gift for anyone and much cheaper than an Apple watch! One of the best books I read this year was the Seven Husbands Of Evelyn Hugo! If you are a fan of great women’s lit this is a must read! OK last minutes shoppers which of these last minute gifts are you going to snag? All great ideas! And I am needing ideas so bad!! I’ve been so busy I had no choice but to leave shopping to the last minute this year!! Thank you for this post! What a great list. I am so in need of a comfy pair of Pjs. I’m subscribing to your mailing list! SUCH GREAT IDEAS! I’ve finished all my shopping, but these may be a few last minute gifts I add on. Those slippers look oh-so cozy! Love the color too! I think an Amazon Prime membership is such a great gift idea! I just signed up this past year and I’m totally obsessed, it’s definitely worth the cost. Amazing gift ideas! I love this post! I would love to have a year of Amazon Prime or a Sephora gift guide! Great list of gifts! These are great suggestions. The Keurig is always a good choice for a coffee lover. I’ve given them as gifts before! My hubby is still not done with his shopping. I totally have to suggest some of the items on this list to him! I’d always be thrilled to get slippers! I’m so hoping to do Amazon Prime sometime soon. It would be really helpful. 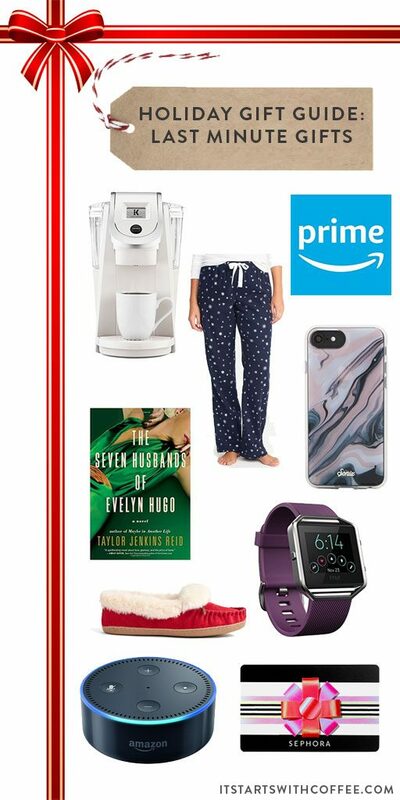 Amazon dot, Sephora Gift Card & awesome jammies…. yes please! I can listen to music in my jammies while cruising Sephora’s website…. WIN! Love these gift ideas! I tend to wait until last minute to buy gifts so this is very helpful! I gifted a couple of Echo dots myself! The Seven Husbands of Evelyn Hugo was SO GOOD! I read it this summer and loved it! I can attest, Amazon delivers those Echos really quick! They must have a bunch in every warehouse! I definitely need to use some of these ideas for my in laws and family. Thank you for the awesome guide. It’s only six days until Christmas. I have only bought two gifts. This guide has several items that will make perfect gifts. Awesome gift ideas!!! My parents got an echo at a white elephant exchange and already had one. So they passed it on to me! Definitely a great gift idea because I love it! Those slippers (in the red) are beautiful and look SOOO comfy! I want them! I got an Echo Dot at a White Elephant party a few weeks ago and love it! It just makes my day easier and and I’m able to reorder things on Amazon without having to pull out my phone or computer.